Chanel, O., Makhloufi, K. and Abu-Zaineh, M. (2016). Can a circular payment card format effectively elicit preferences? 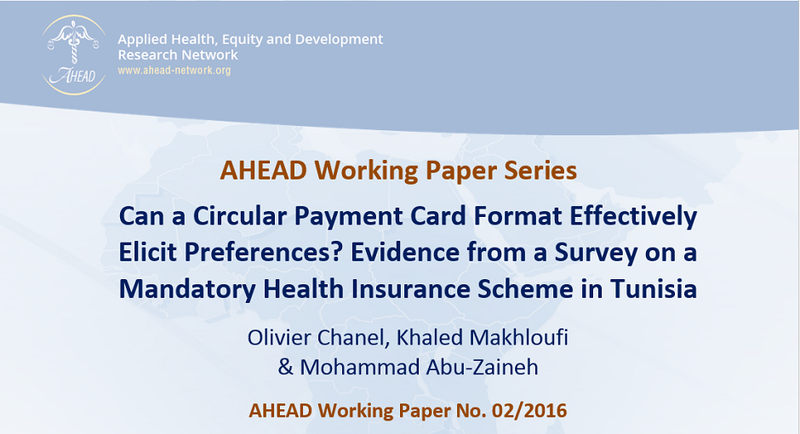 Evidence from a survey on a mandatory health insurance scheme in Tunisia. AHEAD Working Paper No. 02/2016. The choice of an elicitation format constitutes a crucial but tricky aspect of stated preferences surveys. It affects the quantity and quality of the information collected on respondents’ willingness-to-pay (WTP) as well as the potential errors/biases that prevent their true WTP from being observed. Here, we propose a new elicitation mechanism, the circular payment card (CPC), showing that it helps overcome the drawbacks of the standard payment card (PC) format. Indeed, it uses a visual pie-chart representation without start or end points: respondents spin the circular card in any direction until they find the section that best matches their true WTP. We perform a contingent valuation survey regarding a mandatory health insurance scheme in a middle-income country, Tunisia. Respondents are randomly split into three subgroups and their WTP elicited using one of three formats: open-ended (OE), standard PC and the new CPC. We compare the WTP observed and find significant differences in unconditional and conditional analyses. Our empirical results consistently indicate that the OE and standard PC formats lead to significantly lower WTP than the CPC format. Overall, our results are encouraging, suggesting that further empirical studies could establish CPC as a valid alternative to existing formats, especially for low- and middle-income countries.